Shuna, the talented creator of eggbeater, wrote a beautiful ode to baking. Please go read it, I will wait. She explained very poetically exactly how I feel about baking. It is a 24/7, sometimes consuming, mostly happy, aspect of my life. I have woken up in the middle of the night with ideas on certain dessert combinations, on what to add to a cake to make it more interesting, or just worried about the next interview, or in anticipation of the first day of a new job. I am officially unemployed, but not without constant thoughts of what to bake next. I have a starter in the work on the counter, meyer lemons waiting for an inspiration, an ever growing collections of recipes I want to try, recipes I am testing for a cookbook author, a baking class in the planning, dozens posts I want to write, the bowl of the ice cream maker in the freezer for when inspiration strikes, ginger snaps in the fridge ready to be baked, and hundred more things I want to do. Without farther ado, I want to share this recipe I have meant to try for ages and finally did. It comes from the book The Cheese Course, and because I somehow misplaced the second page with the instructions on how to make the dough, I have added my own instructions. The bread requires two days to make, so plan ahead. It is one of those recipes that should come with a warning, as you can't possibly eat just a slice. One day ahead add the yeast to the warm water, and let stand for 2 minutes, then whisk with a fork to dissolve. Mix in the flour to make a loose dough, refrigerate overnight. 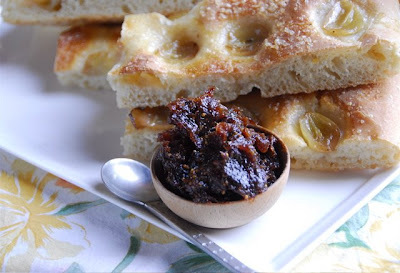 To make the focaccia dough: In the bowl of an electric mixer fitted with the hook attachment, add the sponge, the water, the salt, wine, EVOO, and cornmeal. Mix on low speed for few second, and with the mixer running add the flour until a soft dough forms. Mix at speed 1 for 5 minutes. The dough should clear the sides of the bowl but stick to the bottom of the bowl. Add more flour to make the dough clear the sides of the bowl if necessary. It should still be sticky and soft. Transfer the dough onto a floured surface and pat into a rectangle. Let rest for 5 minutes. Stretch the dough from each end to twice its size. Fold it like a letter into a rectangle. Spray with oil, cover with plastic and let it rest for 30 minutes. Stretch the dough two more times with the 30 minute resting time. Line a 17x12 sheet pan with paper and brush with oil. Press the dough onto the pan, brush it with extra extra vergin olive oil and dimple all over with fingers. Rest the dough 5 minutes to relax the gluten then finish spreading it evenly. 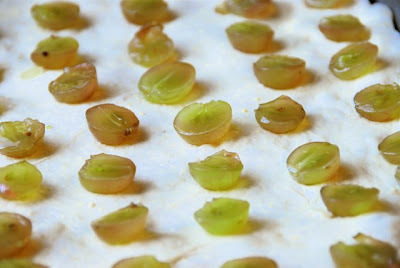 Add the halved grapes on the top, cover with plastic wrap and let rise until doubled in size, 1 to 2 hours, depending on the room temperature. Before baking, sprinkle the top evenly with the crystal sugar. Bake at 375F until the internal temperature reaches 180-200F. Let rest at least 10 minutes before slicing. Warning: extremely addictive! 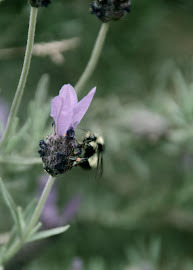 This recipe was submitted to Susan at Wild Yeast, to her yeast spotting weekly event. To learn more about this wonderful event click here. I love looove grapes! This looks fantastic! 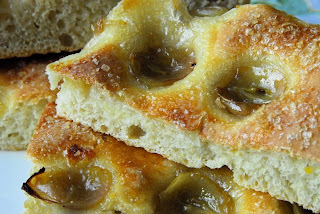 Fantastic and interesting focaccia, never eaten with grapes! This is wonderful, my favorite sort of rustic sweet(ish) bread! I have the cheese coarse too! What a great and fun book....have you tried Hallie's Shallot and Walnut Bread yet? So good! I had been wondering about this recipe too- glad you made it first, now I know that I should too. 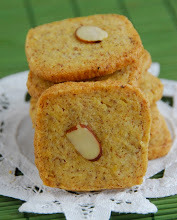 Try this bread, you will love it. Ah, another cookbook junky,isn't it the most wonderful addiction ever. I even threw out some art books (how deep can you get right?!) to make place for my uncontrolable cookbook-collection that is still expending, even if I will never live long enough to make it all! !